Summary: Researchers successfully transform stem cells derived from skin cells into cells that behave similarly to the human midbrain. The most complex organ in humans is the brain. Due to its complexity and, of course, for ethical reasons, it is extremely difficult to do scientific experiments on it – ones that could help us to understand neurodegenerative diseases like Parkinson’s, for example. Scientists at the Luxembourg Centre for Systems Biomedicine (LCSB) of the University of Luxembourg have now succeeded in turning human stem cells derived from skin samples into tiny, three-dimensional, brain-like cultures that behave very similarly to cells in the human midbrain. In the researchers’ petri dishes, different cell types develop, connect into a network, exchange signals and produce metabolic products typical of the active brain. “Our cell cultures open new doors to brain research,” says Prof. Dr. Jens Schwamborn, in whose LCSB research group Developmental & Cellular Biology the research work was done. “We can now use them to study the causes of Parkinson’s disease and how it could possibly be effectively treated.” The team publishes its results today in the prestigious scientific journal “Stem Cell Reports“. The human midbrain is of particular interest to Parkinson’s researchers: it is the seat of the tissue structure known medically as the substantia nigra. Here, nerve cells – specifically dopaminergic neurons – produce the messenger dopamine. Dopamine is needed to maintain smooth body movements. If the dopaminergic neurons die off, then the person affected develops tremors and muscle rigidity, the distinctive symptoms of Parkinson’s disease. For ethical reasons, researchers cannot take cells from the substantia nigra to study them. Research groups around the world are therefore working on cultivating three-dimensional structures of the midbrain in petri dishes. The LCSB team led by stem cell researcher Jens Schwamborn is one such group. The LCSB scientists worked with so-called induced pluripotent stem cells – stem cells that cannot produce a complete organism, but which can be transformed into all cell types of the human body. The procedures required for converting the stem cells into brain cells were developed by Anna Monzel as part of her doctoral thesis, which she is doing in Schwamborn’s group. “I had to develop a special, precisely defined cocktail of growth factors and a certain treatment method for the stem cells, so that they would differentiate in the desired direction,” Monzel describes her approach. To do this, she was able to draw on extensive preparatory work that had been done in Schwamborn’s team the years before. The pluripotent stem cells in the petri dishes multiplied and spread out into a three-dimensional supporting structure – producing tissue-like cell cultures. Scientists at the University of Luxembourg have succeeded in turning human stem cells derived from skin samples into tiny, 3-D, brain-like cultures that behave very similarly to cells in the human midbrain. NeuroscienceNews.com image is credited to ScienceRelations/University of Luxembourg. Image Source: NeuroscienceNews.com image is credited ScienceRelations/University of Luxembour. 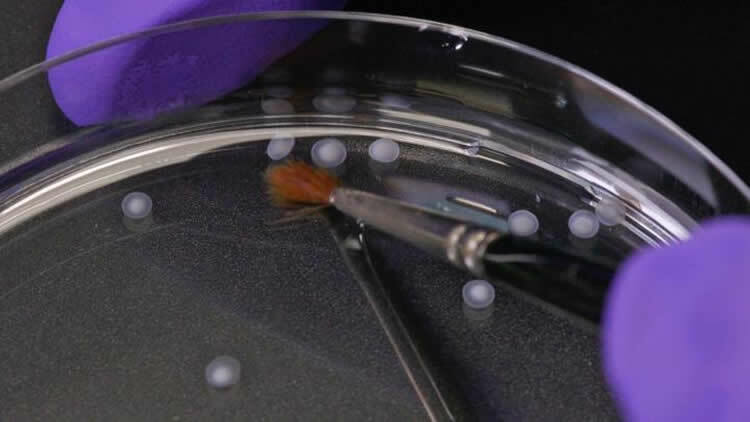 University of Luxembourg “Brain Tissue From a Petri Dish.” NeuroscienceNews. NeuroscienceNews, 13 April 2017. University of Luxembourg “Brain Tissue From a Petri Dish.” http://neurosciencenews.com/stem-cell-brain-tissue-6407/ (accessed April 13, 2017). Research on human brain development and neurological diseases is limited by the lack of advanced experimental in vitro models that truly recapitulate the complexity of the human brain. Here, we describe a robust human brain organoid system that is highly specific to the midbrain derived from regionally patterned neuroepithelial stem cells. These human midbrain organoids contain spatially organized groups of dopaminergic neurons, which make them an attractive model for the study of Parkinson’s disease. Midbrain organoids are characterized in detail for neuronal, astroglial, and oligodendrocyte differentiation. Furthermore, we show the presence of synaptic connections and electrophysiological activity. The complexity of this model is further highlighted by the myelination of neurites. The present midbrain organoid system has the potential to be used for advanced in vitro disease modeling and therapy development.